Ron Oba, front, Takamori Miyagi and Earl Nishioka attended a private screening of the World War II movie "Only the Brave" yesterday at the Blaisdell Concert Hall. 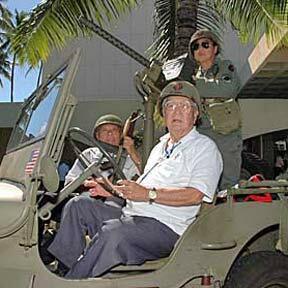 Oba was a member of the 442nd Regimental Combat Team and Miyagi was a member of the 100th Battalion. Nishioka, a member of the Hawaii Historic Arms Association, wore a style of uniform that Oba and Miyagi wore in World War II.